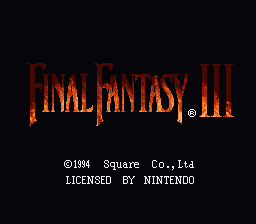 Romhacking.net - Review - So Terra Cannot Use Fire Magic at the Start? Baffling. The magic system in Final Fantasy 6 is overpowered. A single character can learn all available spells in the game, including powerful spells like Ultima and Quick. With the availability of all spells to be used in battle, few enemies can offer resistance. The patch changes the magic system for a new one. The magic command will check the character equipment to determine the availability of spells. If the equipped item or esper teaches a spell, it will be automatically enabled in the magic command as long as it is equipped. If the spell isn’t taught by equipment, it will be disabled for the character. The patch is an alternative for the current magic system. It eliminates the necessity to grind to learn spells and all spells are enabled or disabled based on equipment. 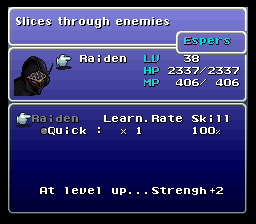 It adds an extra layer of strategy when to choose espers and equipment. Also, it indirectly try to balance the magic system against too many overpowered spells at the same time. The patch was designed for hackers and the data of espers and equipment should be altered to adjust the new magic system. 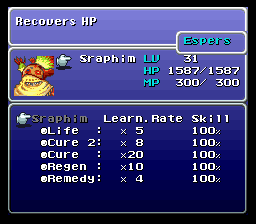 The patch will work with the original data for espers and equipment. However, because they were designed for the original magic system, their data may look poorly designed in the new magic system. So Terra Cannot Use Fire Magic at the Start? Baffling. This mod could be so awesome, but having Terra & Celes not have basic spells at the beginning of the game is at odds with the story that is being told. Terra is this special being that can cast magic, and Celes of course was infused with magic. Not having any spells at the start for these characters is immersion breaking. An optional patch at the very least must be made available. There are 2 options for the patch. 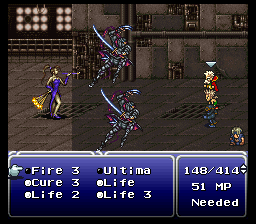 Option 1: Give Terra & Celes some inherent Spells at the start. Terra w/Fire. 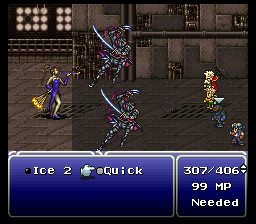 Celes should have Cure & Ice. Option 2: Terra & Celes starter equipment have these basic spells from the start. I hope the mod auther sees this, or someone else, so this mod can be improved to what it could be. It has the right idea, it just needs to be more inline with the plot of the game.